A century before Columbus, a Scottish knight explored Massachusetts. Or did he? 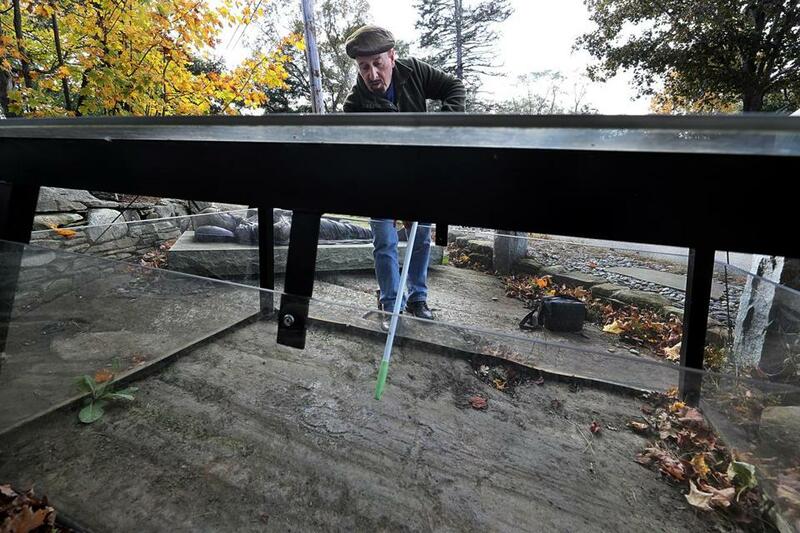 David Brody, a member of the Westford Historical Commission, shows the controversial stone carving, purportedly of 14th-century knight James Gunn, just outside downtown Westford. WESTFORD — Nearly a century before Christopher Columbus set foot in the New World, a Scottish nobleman and his armed explorers sailed up the Merrimack River, meandered up a tributary, and climbed Prospect Hill here to take a look around. They even left a mark, a mysterious image from medieval times that has somehow survived to this day. A fantastic legend, surely; nothing more. But the tale, so tantalizing, has drawn a growing number of visitors to this quintessential New England town, where a stone marker describes the pre-Columbian expedition as historical fact: Henry Sinclair, first earl of Orkney, roamed these parts in 1399. Below the marker near Interstate 495 is the clue some believe Sinclair and his men left behind. It’s a carving in ancient, weathered rock that appears to show an effigy with a two-handed broadsword, the faint outlines of a knight’s helmet, and the barest of borders for a 14th-century clan shield. Believers call him the Westford Knight. Like the UFO that allegedly crashed in Roswell, N.M., the incredible is believed to have happened here. The knight, said to be Sir James Gunn, is thought to have died in Westford during Sinclair’s unproven expedition across the Atlantic. “I’m blown away by how much evidence there is,” said David Brody, fiction writer and former lawyer, as he broomed the controversial carving that has become his passion. Brody, a member of the Westford Historical Society, said visits have increased since “The Da Vinci Code,” the blockbuster book and 2006 movie, piqued interest in Sinclair because of his connection to Rosslyn Chapel in Scotland, a restored medieval ruin outside Edinburgh that played a pivotal role in the novel. The buzz has become international. At Rosslyn, guides tell throngs of tourists about Westford’s link to Sinclair, whose grandson built the chapel in the 1400s. At home, the interest is a source of hometown pride. David Brody shows the "boat stone" at the J.V. Library. Just down the road is the controversial stone carving, purportedly of a knight. There are plenty of skeptics. Some say the Westford Knight is nothing more than a collection of Ice Age scratches. In the 1800s, some locals believed the carving to be a tomahawk-wielding Native American. On its website, the town museum calls it a carving “of unconfirmed origin,” but helpfully offers directions and parking suggestions. “One can imagine the carvings to be seen as a picture of the knight, complete with sword,” the museum states. The curious keep coming — hundreds a year and growing, Brody said — from as far away as Australia to gaze at the stone and imagine history rewritten. For the believers, the evidence placing Sinclair in Westford is compelling. The sword and other marks are consistent with a 14th-century Scottish knight and his weapon, Brody said. Sinclair, who served the king of Norway in the Orkney Islands, would have had access to Norse seafaring technology and nautical charts. In addition, Prospect Hill would have attracted explorers in search of high ground. And a boulder discovered in Westford in the 1920s, also carved crudely, shows what appears to be a medieval boat, Brody said. “The overwhelming weight of the evidence in this case points to the authenticity of the legend,” Brody said. Clan Gunn, which contributes to the site’s upkeep, also buys into the legend. 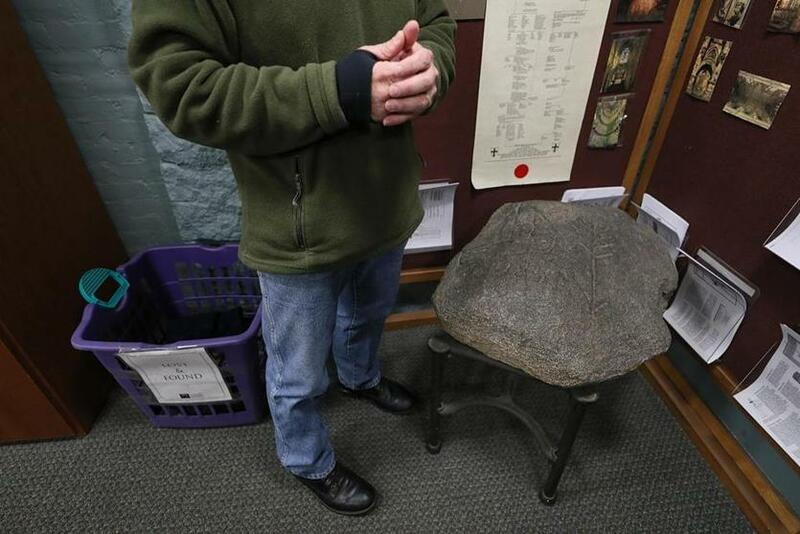 But others who have written about the stone, including Haverhill native David Goudsward, said the Westford Knight is a trans-Atlantic leap of faith without a shred of confirmed historical documentation. The unpersuaded include Peter Drummey, librarian of the Massachusetts Historical Society. “I am afraid that my take on the Westford Knight carvings is an example of the old saying: ‘Things that appear to be too good to be true usually are not,’ ” he said. Similar legends have taken tenuous root in New England, including a tale that the region “was inhabited by a legion of Irish monks living in stone beehive structures long before the usually accepted dates of European settlement,” Drummey said. Such theories are considered by dismissive scholars to be “pseudo-archeology” that looks for evidence, “usually outside the bounds of accepted scientific research, [for] pre-established beliefs,” Drummey said. Brody said he hopes to protect the carving until science can precisely determine its age. Over the past several decades, acid rain and road salt from snowplows have damaged much of the image, he said. As a result, the carving was covered in plexiglass in 2015, work that was funded in part by the Sinclair and Gunn clans. In the meantime, Brody remains a believer that European explorers and traders probably poked around New England well before Columbus arrived in the Caribbean. It’s a belief that sometimes leads to quizzical glances, even in the knight’s namesake home. Politeness, at the least, extends to Town Manager Jodi Ross, who, after a long pause, said she believes that Henry Sinclair, first earl of Orkney, did indeed traipse through the 14th-century wilderness here. Brody and many others are mesmerized by the possibility. “If this legend is true, it rewrites the history books, and Westford is really the first place we know of that Europeans came to explore,” Brody said. MacQuarrie can be reached at brian.macquarrie@globe.com.